We are proud to have presented a cheque for a whopping £2452.40 to St Wilfrid’s Hospice for our fundraising over the last year! This follows the announcement that we will be keeping St Wilfrid’s Hospice as our chosen charity of the year for a second year. Our fund raising efforts this past year has included the donation of vouchers to use for tombola and raffle prizes. To prove our generosity wasn’t just limited to our portion sizes, we then decided to create a special pie and call it The St Wilfrid’s Pie. 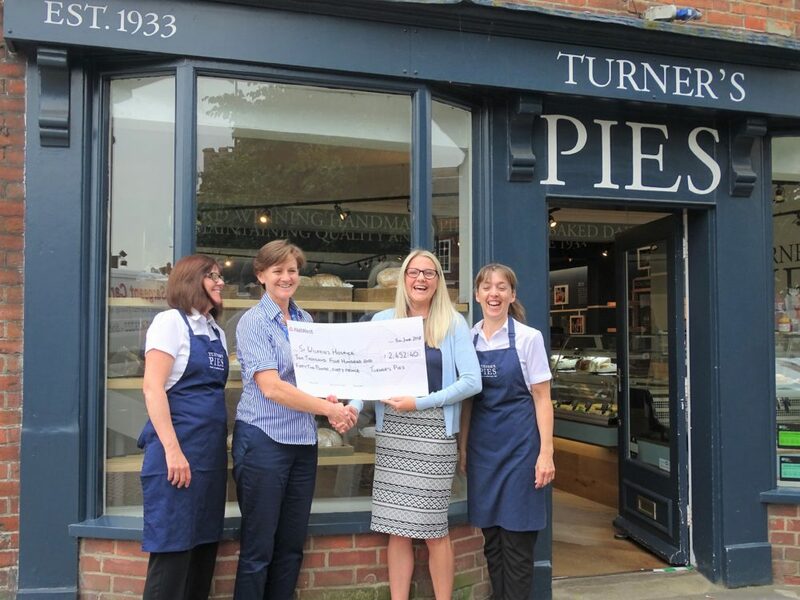 It was sold in each of our three shops throughout last August and we donated all proceeds from the sale of the St Wilfrid’s Pie to the hospice raising £1832.40! The recipe and flavour combination was brand new; chicken leek and potato – delicious. At Christmas time, we came up trumps again and supplied our delicious individual mince pies for the hospice to hand out to people at Lights of Love, an event held at Hotham Park, Bognor Regis to celebrate lives and remember loved ones. Alongside this we held collection boxes at each of our shops for the whole year. This year we are baking up a fresh batch of ideas to support St Wilfrid’s, including Phil, Peter and Joe donning their running shoes for the London marathon and plans to donate our 5p carrier bag charges for the year on to the hospice. St Wilfrid’s Hospice is much more than a building. They provide tailored end of life care both in the community and at the Hospice, supporting patients living with a terminal illness, and their family and friends. Their vital services are all provided free of charge, thanks to the generous support of fundraisers and donors. Only 16% of the running costs are currently met by the NHS and they rely on the community to fund the remainder, which equates to just over £7.5 million each year. You can find out more information at www.stwh.co.uk or by calling 01243 775302.